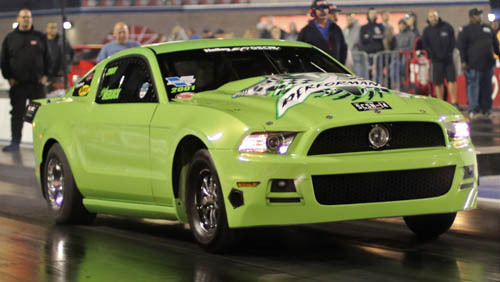 LAS VEGAS - In his first-ever appearance at the Nitrous Outlet Street Car Super Nationals Presented by FuelTech, Arkansas native Brad Medlock drove his 2013 Mustang to the top of the ladder in the Vortech Outlaw 8.5 class Saturday with a pass of 4.593 seconds at 162.22 mph. In Round 1 of eliminations Saturday night at The Strip at Las Vegas Motor Speedway, Medlock slowly meandered down the track thanks to a single-car pass made when his opponent was unable to make the call. "Come out working pretty good and just switched over to alcohol, trying to keep things under wrap with that and try not to get too aggressive, too quick," Medlock said. "Especially with the air change here, it's so much different than what we're used to running. So far, so good." For full results from The Strip, visit Facebook.com/StreetCarSuperNationals. Promoter Mel Roth continued his praise of the track staff after another day of a near-perfect racing surface. "Jeff Foster's crew is amazing," he said. "Year after year, they continue to raise the bar and I can't thank them or our SCSN staff enough. We have a record car count of 493 this year and things have gone as smoothly as they have on our end because of these great folks."